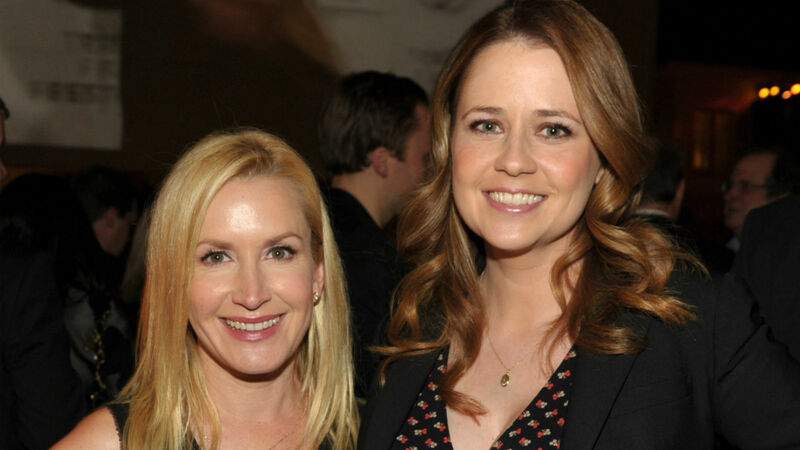 It’s always a great day when part of The Office cast reunites, which is exactly what happened recently when Angela Kinsey and Jenna Fischer got together for Baking With Josh & Ange, Kinsey’s baking series with her husband, Joshua Snyder. The former costars and real-life best friends whipped up some Gingerbread Cake Balls, and even reenacted a scene from the NBC comedy. For those who follow Kinsey and Snyder, then you know anytime they host an Office star, Kinsey and her fellow Dunder Mifflin coworker recreate one of their beloved scenes together. For example, in early December, Kinsey and Brian Baumgartner (Kevin) reenacted a scene from season one’s “Diversity Day”. Well, Kinsey and Fischer once again channeled their characters by recreating the scene from season four’s “Fun Run,” where Angela confided in Pam about Dwight killing her cat, Sprinkles. Die-hard fans will remember they had the conversation over the partition that separated their desks. You bet Snyder even held up a cutting board during the re-creation to ensure the scene stayed true to the original. “My bff, @msjennafischer , stops by our kitchen and we ‘try’ to re-enact a scene from The Office! It went from giggles to tears!,” Kinsey captioned the video she shared on Instagram on Dec. 16. Fischer and Kinsey’s reenactment is particularly special, because it shines a light on their beautiful friendship. You can tell how much they genuinely adore one another. First of all, they can’t stop laughing and have to do multiple takes in order to deliver their lines. As Kinsey says in the video, “If you wondered why we didn’t have a lot of scenes together, it’s because we couldn’t keep a straight face.” At one point, Fischer also becomes emotional due to all of the memories coming back and she almost even cried. Seriously, they are the best. They’ve remained best friends after all these years and it’s truly wonderful. The way they care about each other and how much fun they have together is true BFF goals. The video shows exactly how besties should treat one another. Fischer and Kinsey’s friendship certainly isn’t something either of them keep hidden. They constantly tag each other in their Instagram Stories and gush about one another whenever they have the chance. This year, they even reunited on the small screen when Kinsey guest-starred in Splitting Up Together, Fischer’s ABC comedy — an extremely exciting moment for both fans and the actors. They are legit BFFs and we’re so grateful they’re willing to share their amazing friendship with us via social media. Now, let’s just hope an Office revival happens so we can see Fischer and Kinsey back in action in an official capacity.